Happy Caucasian tourist male raises hands excited. Israel, Jerusalem. Man with arms wide open. Travel. Slow motion. Girl at mountain top, arms wide open. Slow motion. Pretty European woman traveler excited. Happiness. 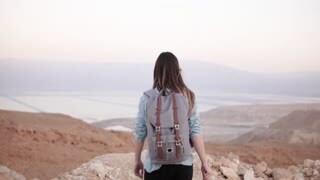 Israel desert. 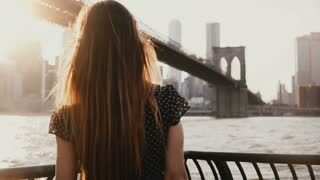 Beautiful female traveler with backpack raises arms wide open with excitement near Manhattan city skyline in New York. 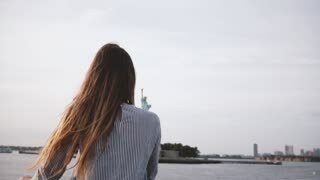 Excited tourist woman with flying hair raising arms in the air on tour boat watching Statue of Liberty view slow motion. 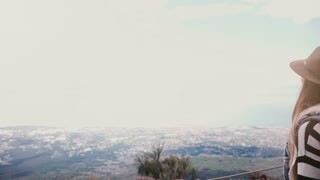 Excited female traveler stands with arms wide open at incredible nature scenery view on Vesuvius volcano top in Italy.